Left to Right: Lynette Allen, Kathy Peart & Steve Barsotti. 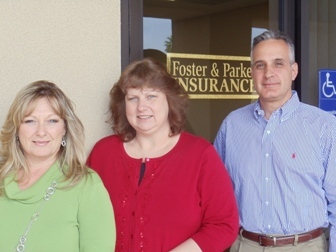 Foster & Parker Insurance Farm Bureau Member since 1995. All types of insurance, including farm package, auto, work comp, life and health. Steve Barsotti owns the business as well as a portion of the stock is owned by the employees. Farm Bureau members can get anywhere from 7 ½% off to 12 ½% off of insurance through Allied/Nationwide Insurance Company. I would like to see more small businesses start and develop in Madera. One of the best ways for a community to advance is the creation of wealth amongst its citizens. I would also like to see the gang situation addresses more aggressively. Gangs and the crime associated with them are decimating our community. Not only causing good people to leave, but inflicting severe economic damage to everyone. We participate in almost every community project our clients ask us to be a part of. I feel that is one of our obligations to our clients and our community. Just another reason we give people to buy local. To stay current we have updated our company website and become involved in social marketing including Facebook and Manta. The discounts we receive easily pays for the membership fee.